How about a page discussing the long L + 1 group? I think this group is unconditionally alive, but merits discussion since it could also easily result in ko or seki. MrTenuki: Is this what you're talking about? I think it is probably common and merits some sequential analysis. Especially if there is already a descent on the outside. Dieter: Since the long L group can be turned in a 1000 year ko only, it is to be expected that the extra leg provides life. 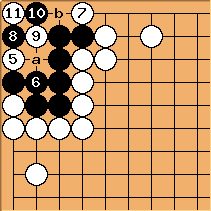 The only remaining question seems to be whether White can rob the territory through seki. However, the lines at a and b separate the circled eyespaces and it is difficult to see how White can turned these into one eye or connect to the outside. Maybe the original poster can suggest an attack and we can concentrate on refuting it? 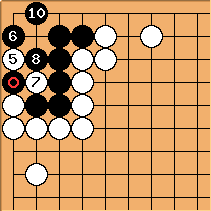 I've seen this sequence in my games before, as either side. 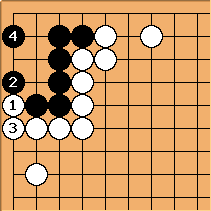 Playing tenuki with can be considered, but I don't see a way for Black to live unconditionally afterwards if is played elsewhere, unless Black is willing to give up a few points. 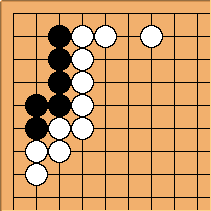 If Black plays elsewhere with and White replies with as shown, this could happen if Black is bent on saving every stone. If is played at a, is played at , and the group dies. And at can be refuted by at . 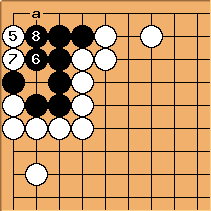 But above is actually a mistake, because Black can live by sacrificing a stone. This lives, albeit in gote. 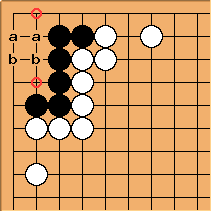 Tapir: I don't see a way for black to live without ko after . at will result in the same ko, imo. 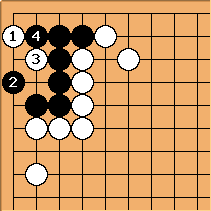 All other moves namely at or a doesn't work, as far as i read. Eba shows this attack and defense.